Have you ever wondered why so many people are obsessed with tea? Well, they are on to something because tea has so many great benefits for the human body, especially when it comes to anti-aging. Why Is Tea So Good for You? Studies have shown that most of tea’s health benefits are due to polyphenols, which are a type of antioxidant, and phytochemicals. Polyphenols are micronutrients that can help to improve or treat weight management issues, digestive issues, diabetes, cardiovascular disease, and neurodegenerative disease. Phytochemicals are nutrients that are believed to help protect cells from damage and to help avoid cancer. Tea can help combat the body’s aging. Free radicals and the chemical reactions within them tend to be the blame for the aging process. These free radicals damage healthy cells by depleting them of oxygen and reducing the levels of collagen. Collagen plays an important role in keeping the radiance and elasticity of the skin alive. The antioxidants found in green tea have been found to actually combat these free radicals and to repair the damage that they have caused. Have you ever wondered why the Japanese culture has been looked at as one of the healthiest in the world? The Japanese are known to have the longest life spans, having many hit the ages of 80 or higher. The Japanese culture is also among the highest consumption of green tea in the world and they may be on to something. Green tea is known to have the highest concentration of catechins and polyphenols. Therefore, it is jam packed with antioxidants that work to destroy free radicals and help to restore a more youthful appearance. Green tea holds high levels of oligomeric proanthocyanidins, OPCs, these are some of the strongest antioxidants, there working twice with their anti-aging properties. By drinking green tea eventually the aging process will slow down because your free radical count will drastically lessen. A Chinese study conducted determined that those who consume green tea, had their cells age at a must slower pace than those that did not. It was also found that green tea helps to reduce cartilage and collagen destruction in arthritic joints. This is very helpful as the body ages. It has been found to prevent osteoarthritis and rheumatoid arthritis, as well. Studies have also shown that green tea can help to reduce bad cholesterol, regulate depression, and blood pressure. For women going through menopause, there are teas that can help to combat some of the symptoms. Tea is a natural way to help make you feel better during this process. Black Cohosh Root tea has been found to help reduce hot flashes and vaginal dryness in menopausal women. Ginseng tea has been shown to help reduce the severity and occurence of hot flashes and night sweats. Chasteberry tea has been found to help reduce premenstrual symptoms that can occur during menopause as well as to reduce breast pain. Dong Quai tea helps to regulate and balance estrogen levels within women that are entering menopause. Tea is also beneficial to men going through andropause. Drinking tea will help to combat those free-radicals and work towards making your body healthier in general. Drinking American Ginseng tea can help to heighten and restore male libido. 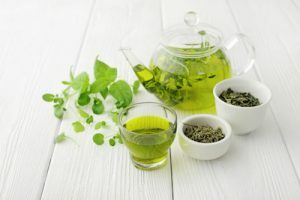 While green tea tends to be the most popular when it comes to anti-aging there are plenty of other types of tea that also offer wonderful health benefits! When going through menopause and andropause, why not take advantage of some of these benefits by simply enjoying a delicious beverage within your daily routine. Black tea also has an abundance of phytochemicals and antioxidants. These can help to prevent cancer, heart disease, promote healthy skin and hair, and to improve bone strength. Black tea has also been found to help improve memory and mental alertness. Hibiscus tea has also been found to help reverse the effects of aging fighting free radicals. Hibiscus helps to prevent heart disease, diabetes, cancer, and rheumatoid arthritis. Oolong tea contains various minerals and vitamins that are beneficial for your overall health. It can help to detoxify the body, provide gum health, and to strengthen bones. White tea holds the highest levels of antioxidants. It helps to protect the body from the damage of free radicals, protects skin from premature aging, and helps to maintain collagen levels. 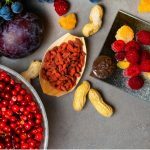 Studies have also shown that it can help lower blood pressure, cholesterol levels, maintain stronger bones and connective tissue, and to protect the heart. tgwtms,If you want a hassle free movies downloading then you must need an app like showbox which may provide best ever user friendly interface. batofhdv,A very good informative article. I’ve bookmarked your website and will be checking back in future! giglrrmoahn,Some really nice stuff on this website, I enjoy it. qoaeyeul Yeezy 2019,Very helpful and best artical information Thanks For sharing. vhwkrz,If you have any struggle to download KineMaster for PC just visit this site. dlqrnupigy Yeezy 350,Thanks a lot for providing us with this recipe of Cranberry Brisket. I’ve been wanting to make this for a long time but I couldn’t find the right recipe. Thanks to your help here, I can now make this dish easily.